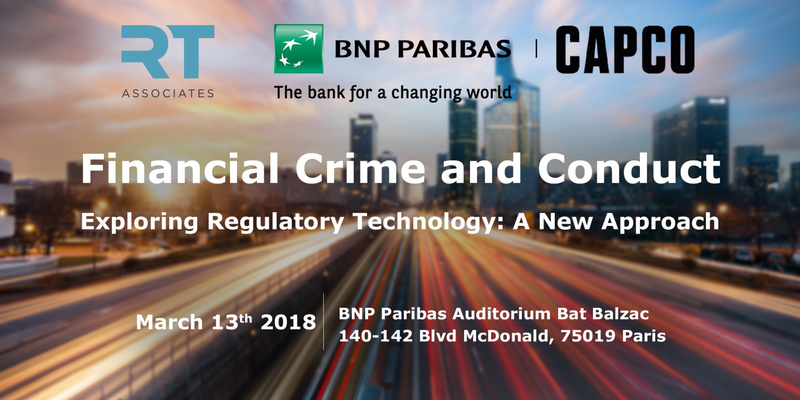 RegTech Associates, in partnership with Capco and BNP Paribas (Paris), will be hosting an event on March 13th, 2018. The theme will be Financial Crime and Conduct – Exploring Regulatory Technology: A New Approach. Starting at 5.30pm with registrations, the event will offer networking opportunities and a dedicated networking area for specific partners. The event officially starts at 6.00pm, and after the formal talks you will have the opportunity to network with your peers during the cocktail apéritif. The event will close at 8.30pm. At 100+ attendees, the intimate event will be a chance for RegTech solutions providers to interact with senior attendees from BNP Paribas, HSBC, other financial firms in the compliance business, Capco’s management and customers, and members of the RegTech community including regulators, regulated companies and service providers.